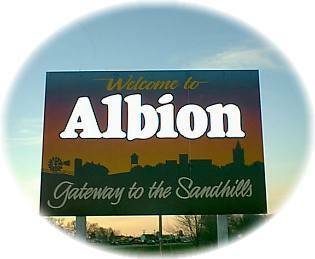 Known as "The Gateway to the Sandhills," Albion borders the famous ranch and cattle country of Nebraska's vast region of rolling sand hills, yet itself, in contract, is nestled amid the fertile farms and luxuriant grasses of Beaver Valley. It is the county seat of Boone County and was settled by a group of people from Columbus, and in 1872 was platted choosing its name from Albion, New York. Albion's park draws bicyclists annually from BRAN (Bicycle Rides Across Nebraska) and TOUR de Nebraska offering riders and staff spacious picnic and recreational areas including restrooms and RV hookups, and swimming pool. In addition, the indoor facilities at the Boone County Fitness Center include a swimming pool with whirlpool and sauna, two racquetball courts, a weight room, a track, and state-of-the-art exercise equipment. We are proud to receive such comments as this one from one of the riders from Colorado who replied, "Thank you for organizing our wonderful stay in Albion last night. From the swim in the pool to the evening entertainment it was delightful and refreshing after our day long ride. The early morning breakfast was greatly appreciated. Your community did an outstanding job showing us the meaning of hospitality. We invite you to come and share with us during our summer celebrations of Down Home Days in June and the Boone County Fair in August. Plan to stay a few days and visit some of the Boone County historical attractions while you're in the area. Fuller Park would be the perfect site for your next family picnic. It has four covered dining areas, playground equipment, restrooms, and R.V. hookups.